Red scheme: Geum ‘Blazing Sunset’ , Anthriscus s. ‘Raven’s Wing’ , Streptanthus albidus peramoena “Jewel Flower” bring strong contrast, bright color together with pleasing effect. By anniesannuals (originally uploaded to Flickr as Spring Garden 08) [CC BY 2.0 ], via Wikimedia Commons. Foliage color is a fine way to introduce variation in all seasons; so consider the addition of variegated foliage, purple tinted leaves, golden and some of the other types of leaf or needle color. Flowers, combined for bold contrasts or subtle harmonies, are the glory of three of our four seasons. 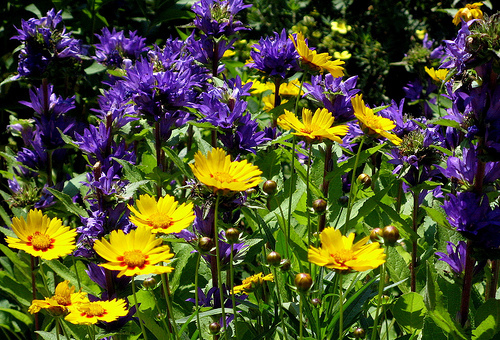 Everyone thinks of spring and summer for color in the garden… but who plans their fall garden for bursts of color? And most of us decide that we need flowers to brighten up the garden views, but who puts colorful foliage plants first on their list? 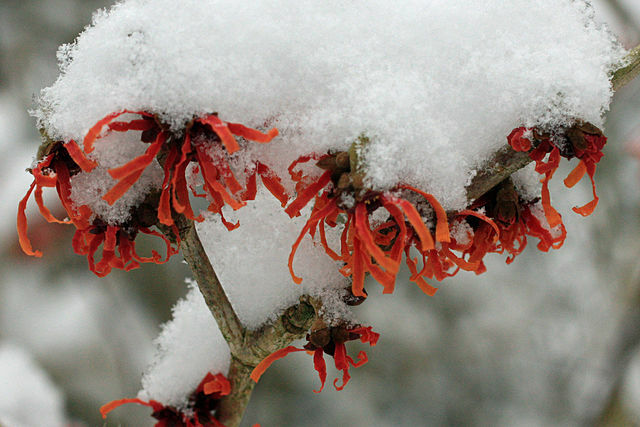 Or brings berried trees and shrubs for winter beauty? The smart gardener like you, that’s who! During autumn, foliage becomes the primary focus. Sometimes in surprising places such as the gold of hosta or Convallaria majalis. Leaves of the Lily of the Valley plant turn a golden orange tipped in bronze. Leafy contributions most commonly thought of are Autumn changes, but other seasons have their fair share of gold, purple, chartreuse, and even pink and red tints. Conifers come in different shades for winter, even twigs may add some color to the garden landscape, whether bright green, yellow, or coral red. Do You Use Foliage For Accent? …as part of the color plan in your landscape. Remember the colors of your house when choosing colors for your yard. 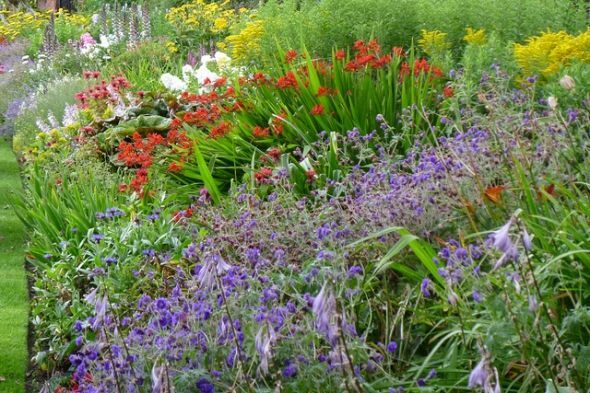 Whether it is the large swathe of a perennial border or a small addition of containers by the steps, flowers can deliver color in any hue you desire. A group of flowers can bring a combination of colors to create moods of harmony, calm, or excitement. There are certain places that most people like to have some color, and that is at the entry or closely surrounding the house. Like the glint of a jeweled necklace framing a face, the colorful accent of garden color close to the home’s entry seems most pleasing to the owner and their visitors. Perhaps that is due to the idea that a special spot of color bids welcome and speaks of the anticipation of the hospitality within. I don’t know if that is simply an idea we have cultivated with flower arrangements and houseplants or if that is something hardwired into the human psyche, but it seems to work in that mode. “Bright plants or flowers do a lot to enhance the entry. Because of the possibility of combining different types of foliage, purple and gold plants together are a popular combination. Too much of this constitutes what I call “a garden no-no”. It looks harsh and unnatural to the point of being annoying. So you like hot pink, leopard prints, red heels, and dangling chandelier earrings all at once? Yes, and some people like the garden equivalent. It is your garden, after all, but most of us viewing it don’t like such strong color contrasts en masse as well as you, in that case. There are always those case which break the rule, so I rarely make hard and fast ones for the look of a garden; there are people who have an unfailing artistic sense who can create even the most garish elements into something appealing. Distinctive shapes highlight the interesting range of leaf color in a front entry. I love a touch of contrast, a golden accent here, a grove of purple-leaved trees there, a large amount of gray foliage and purple foliage with grays. I like the combination of golden and glaucous foliage- “glaucous” being the blue effect that some leaves have. I like purple foliage combined with red and bright orange flowers for a “wow” effect in a sunny spot. Quite amazing color effects can be done done with either only leaves or leaves and flowers in this pairing. Try some of your most adventurous ideas in containers- they last for the one season and if you love the effect you can use it on a grander scale at a future date. If not, it was fun to see your idea for a time and to change it up the next year. 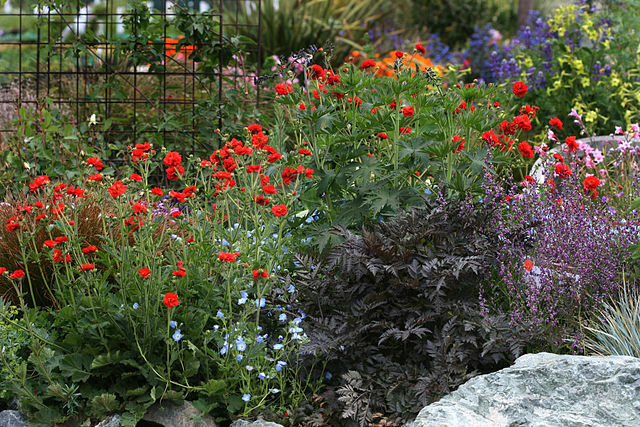 Try two or three plants of the same kind to give a bold splash of foliage color in a garden. Take, for instance, the Goldflame spirea. The original form of this spirea shrub is very nondescript (although I like it). It has pretty pink flowers in season, but the rest of the time is a fairly dull green plant with small leaves. 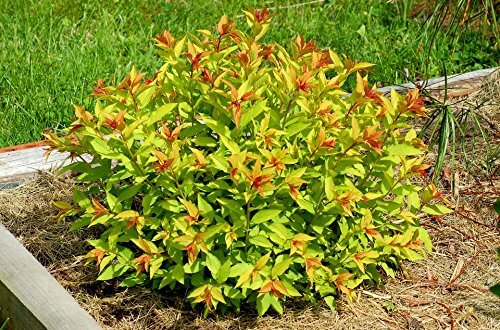 In its ‘Goldflame’ form the spring leaves start out with a range of dawn colors of pink, reddish tinge, and pale gold, become a deeper golden color for summer and turn tints of yellow, pink, and orange for fall…while the bright pink flowers will bloom in their season, as well. 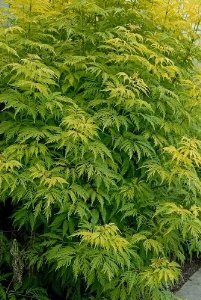 It grows best in part sun/part shade where its colors is most welcome, and the contrast with green leaved plantings becomes a brilliant spot of color even when nothing is blooming. 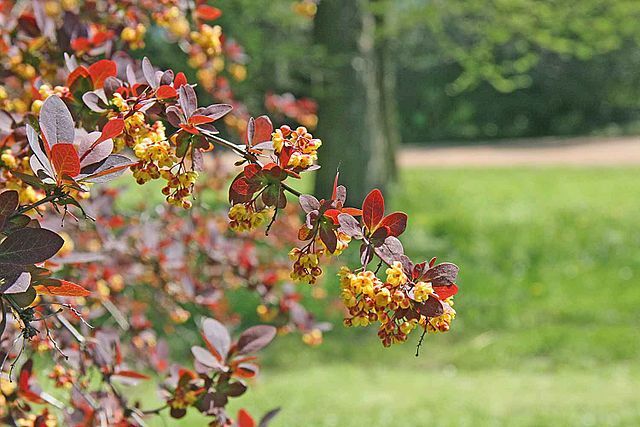 Coggyria is an ornamental tree with varieties that include strongly colored leaves in gold or purple tones. Its name comes form the frothy look of the flowering parts; they look like a cloud of softly color smoke. It is a very interesting addition to the landscape. Berberis thunbergii var. Atropurpurea brings contrast into the spring palette. 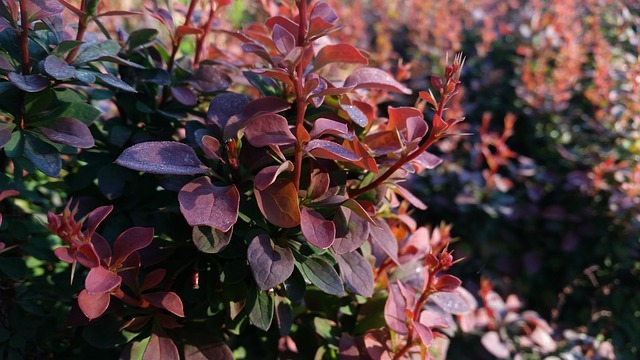 Purple Berberis foliage is very popular. It is tough and comes in a variety of cultivars. It takes hedging exceptionally well. 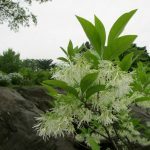 A drawback is the fact that it is sometimes considered an invasive non-native shrub. Because of the drawing power of colorful plants, especially when pattern plays a part, these are plants to accent, and not overdo in your garden plan. Variegated plants are those with color variations along with the usual green: green and gold, green and cream, pink, green and gray. When introduced into a mostly green backdrop they provide a lift to the whole picture. Many plants have variegated mutations. 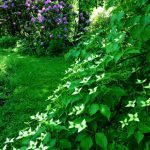 Some I really like are the large shrub Cornus elegantissima, variegated hollies, and the many types of hostas with beautiful gold or cream streaking the green or bluish-cast leaf color. Where do subtle effects go wrong? When too bland and lacking in personality, the beauty of a plant can be lost. Plan for an autumn garden with spectacular color. Plants take on a whole new look when the first cold temperatures of fall touch their leaves. What flower can compete with the golden, scarlet and glowing orange hues of the trees in their autumn garb? Don’t let your garden be dowdy when the October fling of festivity comes around. Any other time of year such competition seems gaudy, but not in the fall! 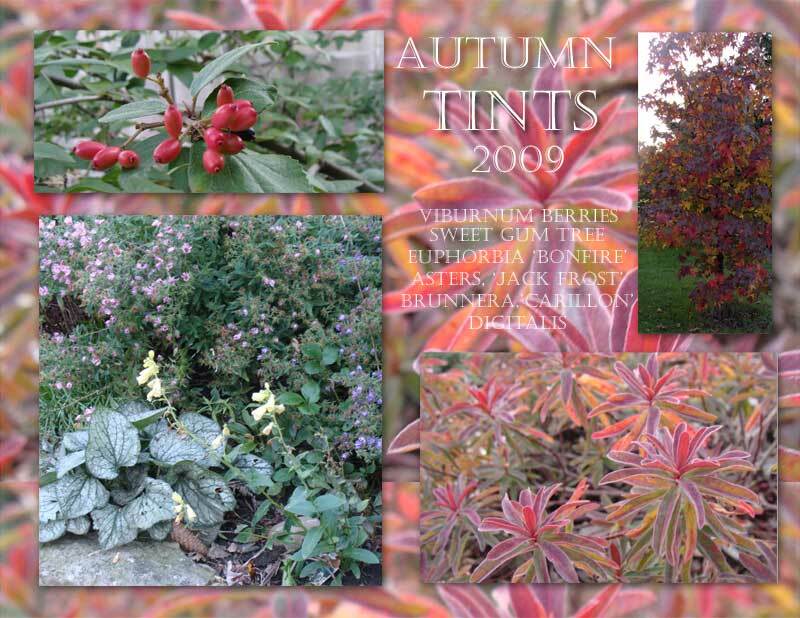 Choose some of your shrubs and even perennials for their end of season tints. Some trees are grown only for the beautiful leaf colors they turn in the fall. Look for those to brighten your yard. Note in a journal the plants that have beautiful fall color like hostas and balloon flowers, then combine them to good effect for this season’s show. The golden autumn leaf color of the Ginko tree in the photo at the beginning of this section is a wonderful example of autumn leaf color at its finest. 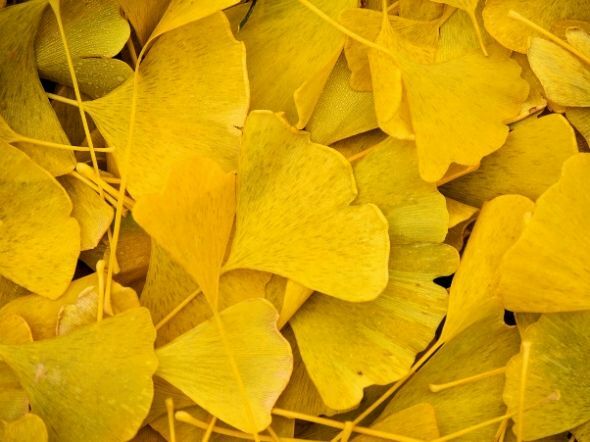 The fall color of the Gingko biloba tree is a golden clear yellow. Choosing such trees and shrubs give the autumn a richness that shimmers against the clear blue skies and surprises the eye after the summer of green background. Great Accents Or Garden No-Nos? Strong visual impact can come from the often brassy or moody shades of foliage variation. Or the patterns of variegated leaves in the landscape can either be a focal point or become too much of a good thing when dotted throughout a garden space or massed together in a mish-mashed, unidentifiable collection. Too much of a good thing can tire the eye or create a heavy imbalance which is more disturbing than delightful. Very dark purple leaves, extra powerful contrasts plunked into the middle of the yard, harsh and grating colors with no transitioning or mellowing partners … those can all be disconcerting “no-no’s”. 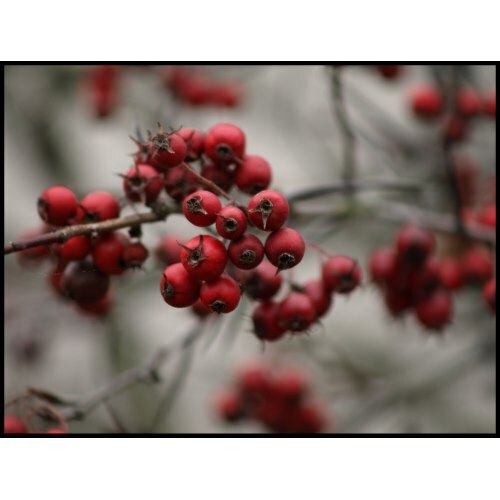 Winter berries bring much needed color to the landscape and stand out all the more. Additionally they attract birds. Don’t overlook berries or fruits as colorful additions to your garden plan. BerriesBerries are king in winter, and they give color and a wildlife food source. Often overlooked when planning garden plantings, but one of the secrets of a really great garden. Remember to plan for colorful berries, they can be red, but also yellow, orange, even blue or purple. 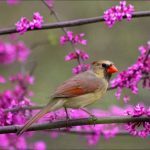 Using color in your garden is much like creating a painting, with easy to learn concepts of color harmonies as the basis for making a gardens that gives visual joy to all who see it. Find ideas on creating all season beauty in your yard, and keep reading for a primer in color theory for the garden, all included in this page. Rainbow spectrum or a carefully chosen palette, flowers are a main source of instant impact. They reign in spring and summer seasons. Leaves and stems will also hold their own with both bold and subtle effects. Monet’s garden at Giverny is a revelation. 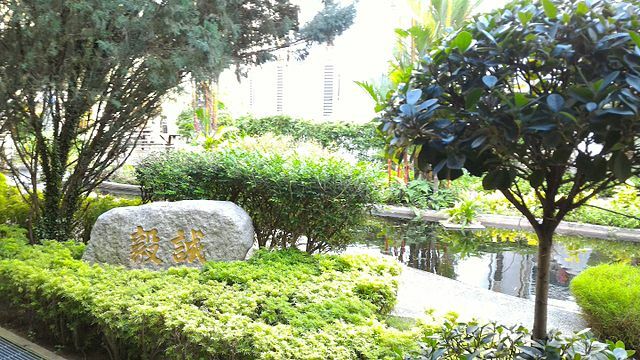 It was a master’s use of plantings that gave him inspiration for many of his most famous works. If you need color inspiration ideas, take a tour of his paintings. 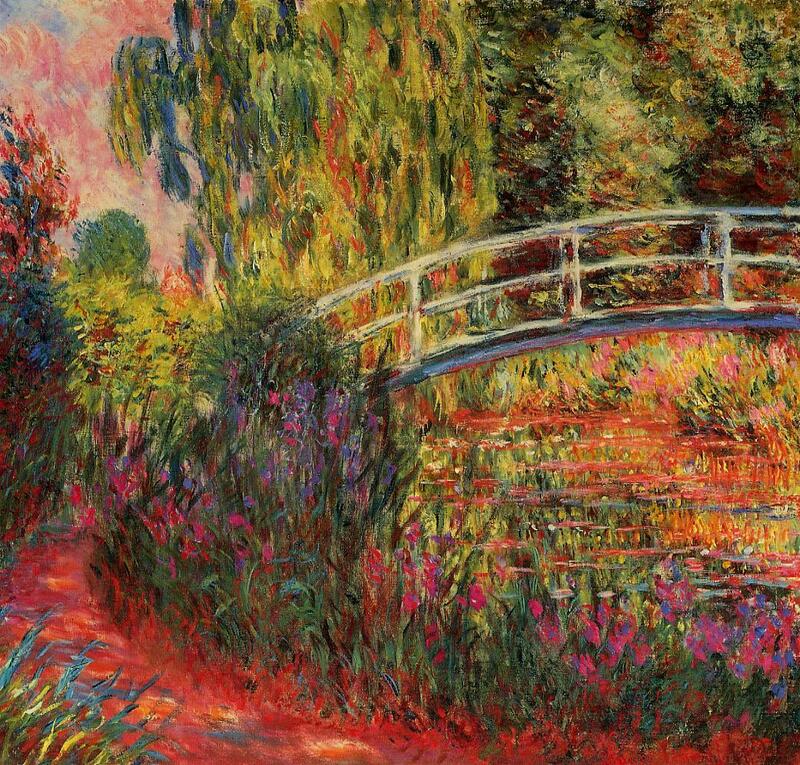 Monet’s Garden, as he saw it. Here is just a little about color to get you started, learning more about color theory is one of the best ways to improve your design sense for inside AND outside the house. Warm colors are red, orange, yellow. Cool colors are blue, purple, green. Marvelous Coleus brings bright spot to shady places. Analogous color scheme: colors that are next to each other. Monochromatic colors: colors all in the same family; i.e. all blues. Triadic Color: three colors evenly spaced on a color wheel. Gain confidence in your use of color, learn from the experts. Nothing has helped me more in imagining plans and creating beautiful planting arrangements than books that hold advice from widely respected designers. It is all the better when photos of actual gardens inspire the process of putting together plants that bloom well, and at the same time. Sometimes we are too timid, fearing that colors will clash or we don’t know whether something we are planning will work. Allow garden artist Keeyla Meadows to entice and inspire you to go beyond the ordinary. Think about your own ideas of color and how those from your environment or even your wardrobe could cue the design of some color additions to your yard for landscape interest and visual pleasure. There is something to be said for those small joys of the day, such as looking out the window to see a picture of something colorful and bright. Color mutations and varigation of leaves are loved by gardeners for good reason. Golden leaves or purple ones create a new way to add color that lasts much longer than a plants blooms. They may have seasonal variations as well. The solid forms don’t have the spotty, too-busy look that variegated leaf plants may contribute to a view. This type of plan requires self-discipline, with only one color chosen to create the look. Often used in plantings of conifers or one color gardens that rely on flowers for their main source of color. Strong complimentary hues of the same saturation bring excitement wherever they are placed. Just don’t overdo it. Hues speak messages to us- depending on our experience and culture, but also sometimes by the effect on our physiology. Color can be calming or exciting, it can whet our appetite or soothe our irritability. Consider this when designing a garden for yourself. Warm colors, red, orange, yellow stand out and draw the eye; cool colors, blue, purple, green, tend to recede into the background. Gray foliage is a great mixer- use it to separate colors that don’t look good together. Too much contrast is not a good thing, choose your contrasting effects wisely, and use them sparsely. Strong contrast can make a statement, so at times it is good to go bold. But remember the previous caveat: don’t overwhelm your garden with too much contrast, but don’t be so afraid that your garden becomes boring. You can always move plants around, or even take them out altogether. …that you can find, or combine the most contrasting colors available unless it is small doses. Instead, why not have less color but more change in texture? Coarse large leaf plants combined with small fine-leaved ones? A serene garden is almost always done in soft pastels or shades of green and white, while hot color gardens create a feeling of convivial cheerfulness. What do you wish to be surrounded by? Don’t allow your yard to be simply a backdrop, but make it into your preferred environment with the use of color. Many examples of masterful use of flowers and foliage for beautiful pictures throughout the years may be seen in great gardens such as England’s Hidcote. I haven’t surfed garden blogs in forever, it seems. But today was different and I garnered some great ideas that I hope to put to work for me this year. We’ll see. It all depends on both how diligent I am and how much traveling I need to do. (Since I am the sole gardener, traveling can really put a wrench into my gardening plans). 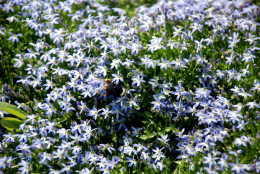 Growing a blue garden phlox called ‘Moody Blues’. This and the next idea come from Sue’s Garden Journal. I am not always super successful with this type of phlox, but I would love to see these blooms in my garden. Planting the ends of my vegetable beds with flowers. I already plant flowers along with my vegetables (I can’t help it, it is an obsession). The look of neat little ends is tempting to me. I snipped a picture of how it looks in her garden and a homemade graphic of how I envision mine. She’s a more ambitious and a neater gardener than I can be at this time of my life. I note from my own experience that the stone edging is pretty, but needs weeding attention. The whole reason I like this idea is that I often have to weed the perimeters of the raised beds. A problem made worse by chickens who like to scratch in the mulch ( an idea which originally was meant to reduce weeding). Not sure what I would do about those chickens, but the edges facing the lawn (necessary because the septic system is underneath) and house would be laced with flowers. This would not only look pretty, but draw pollinators, and fill in vulnerable spaces with desirable plants. Any area filled with desirables is less space for the UNdesirables. I love the way her garden mixes flowers and vegetables. My vision is similar, but without the fieldstone. I think I will need something, but not sure what. old fence boards (cut to size) laid flat could work. I’ve used salvaged brick in other parts of the garden. I like the the thought of the boards, but not totally convinced. The flowers I would most like to see in this picture are the little single Tagetes (Marigolds). They would serve double duty as nematode controls, hopefully. If I am to gain control of this garden in the new season, weeding and preparation will have to be aggressive in the earliest part of the Spring that I can work the soil. I do admit that two of the raised beds on the side need to be recovered from weeds. One was mostly reprocessed this past fall, but the bed with strawberries is more of a challenge. You may remember my front walk ‘lavender hedge‘? Well, after reading an ode to the fragrance of lavender plants, an idea was sparked for me. I have a raised planting area along the back deck approach. Nothing grows there. Not mint, nothing. I think it is too dry for what I attempted to grow. So, this year I will try herbs which like dry feet, lavender to be precise; and maybe a rosemary just to see if it will survive. Those are my humble ideas for the garden this spring. New plans for a garden don’t have to be unique or cutting edge trendy. They may simply be a good solution for a particular problem, or inclusion so something that has proven pleasing elsewhere. I remember reading an English garden writer years ago, it may have been Margery Fish or it may have not. The point was made that some flowers can be perfectly suited for planting even though they were spurned by the garden world cognoscente. 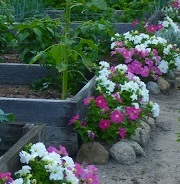 Such blooms as lobelia, pelargoniums, alyssum, and petunias. It made a lot of sense to me: why should we be plant snobs? What Makes a Low Maintenance Garden? 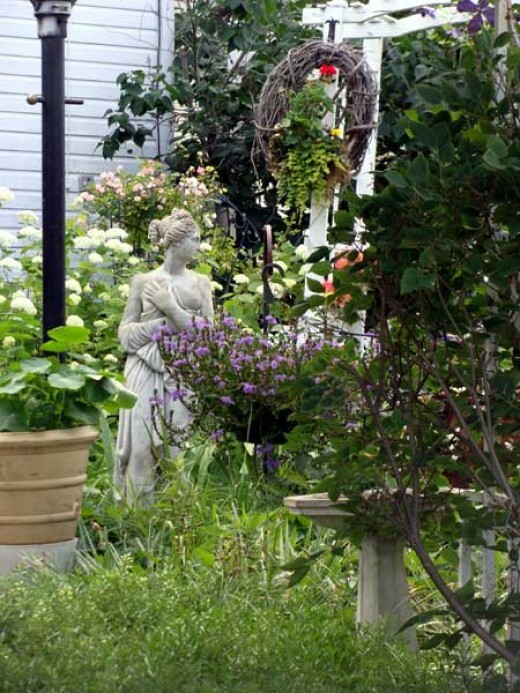 It is increasingly the Holy Grail of garden designs: making a landscape low maintenance. For many reasons, reducing the work load of our outdoor spaces has become a priority. That is not the definitive list, by any means, but it does hit the highlights of why this style of landscaping is increasing in desirability. What are the Characteristics of Easy Care Yardspaces? Perennial Plantings. The more permanent the planting, the less work it involves annually. Chores of caring for the plants are still present, but the larger larger spaces that are taken up by the individuals and groups of trees, shrubs, and long lived herbaceous flowers will cut down on weeding and replanting. Larger Groups. This is basic to good design, too. using a larger number of the same kind reduces work in two ways: symbiotic health of the plants is increased and the required care is given to the whole grouping. Like-minded Plants. Culturally harmonious in moisture fertility, and light requirements means they stay happy together and the gardener doesn’t have to cater to one or two unhappy plants in the group. Hardy and Tolerant. Under your garden conditions, the plants should be varieties that are easier to care for to begin with… persnickety ones demand more cultivation, attention, and replacement. Mowing Ease. In your design, tailor the shape of beds and tree wells, as well as the position of low hanging branches to aid in ease of lawn maintenance (if you have a lawn). Those are my top 5 tips for creating a more low maintenance space. A formal, manicured style is much more work than a naturalistic design. 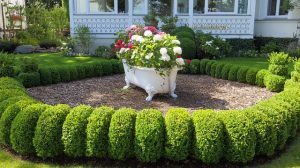 Manicured shrubs take constant care. 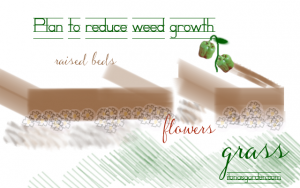 There are other refinements like using mulch to suppress weeds and conserve moisture. Increasing the amount of shrubbery for fragrance, flowers, and foliage interest is another improvement to be made in most landscapes. Don’t overlook the value of well-behaved shrubs. Dwarf shrubs add color and seasonal interest. One consideration related to suggestion #5 is whether a plant is a thug, having invasive traits. Think, before introducing it to the garden. Sometimes it is a fine line of definition that divides the ground covers from the invasives. Find out “what is considered what” in your own area of the country. Soil building is foundational to better gardens with less care. 1 Starting over from scratch in designing the yard might be the quickest way to ensure that it adheres to all the best practices in lowering the workload. Use hardscaping to control and access portions of the garden. 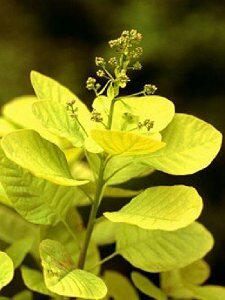 Plant only easy to grow, healthy trees, shrubs, and flowers. 2 Most of us are in the second group, however. We inherited a garden, and important large trees, or we have a love of growing a wide number of things, both easy and more challenging. Yet, the need to have a less demanding landscape is imperative for us. For gardeners in the second group, some hard decisions need to be made: removing certain plants and even woody specimens. 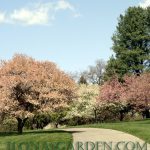 Forgoing types of plantings or styles that are labor intensive is another choice sometimes made, sometimes forced upon us. Both efforts -whether starting from the beginning or taking over an established landscape- benefit from improving the soils with compost and amendments. ‘Catherine Woodbery’ is a tried and true Hemerocallis. Those backbone species don’t need to be the entire composition of your own place, but can start out your short list of easy care plants. Use choices planted in berms and along roadways to give you ideas for what works well in your climate and/or urban conditions. The garden should serve the home and the people in it. At the same time, recognizing that it fits in the greater ecology of the planet, the use of the earth surrounding our houses should be healthy for plants, animals, and humans alike. Lower maintenance goals work alongside this greater one, since designing in tandem with nature means the garden will require less to look good. The plants are healthy when they have the soil, light, and moisture that is best for their needs. They will then need little to no interference of chemical support. Though the usual sequence is to plant the bulbs in the fall for bloom in the spring, some growers cheat the system by chilling those sold for spring bloom. This is necessary for Southern gardens which don’t get the required cold temperatures. 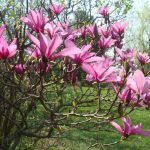 Presented here are some of the fine selections that you can plant in your own gardens to brighten up the Springtime with color and fragrance. Find out if the small bulbs, tulips, or daffodils might be best for you. Planting and maintenance tips, secrets to success, all included for your pretty garden. 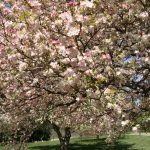 Though planted in Autumn, Spring is the best time to make lists of varieties to order or look for when the season rolls around in late August. The Dutch have perfected the bulb growing for ideal blooms. Most bulbs are shipped to stores and gardeners at planting time ,starting about September. Bulbs come in different sizes according to variety, but also due to quality. They produce 4.32 billion tulip bulbs annually, some of which will grow cut flowers. 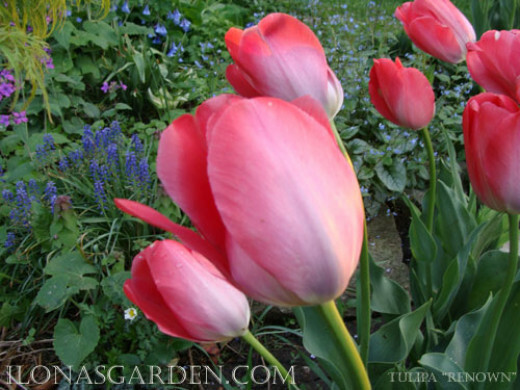 Because tulips and other fall planted spring bubs are grown in Holland to ideal size, it is important to get the largest bulbs you can. Look for tight tunics (the brown skin), a feel of heavy weight for the size, to indicate freshness and health. Although bulbs differ in look, they should feel heavy, since the lighter they are the more they may have dried out. When taking care to get the best bulbs, be sure to plant them promptly. This allows the roots to get a start on the winter. When ordering online, the catalog should record the diameter of the bulbs offered, usually in centimeters. This is the way to gauge the quality of what is offered. Bulbs are simply a storehouse which contain the baby plant in entirety. Everything needed for a beautiful blooming plants is right inside the bulb along with a storehouse of food for that year. This is why we can “force” bulbs for inside the house during winter months. It also explains two other things: why forced bulbs are useless to plant in the ground and why we need to leave the foliage growing after blooming. The foliage is fattening up the storage bulb and creating the next year’s flowers. Find a sunny spot- most spring flowering bulbs need full sunshine. Make sure the soil is well-drained. These bulbs will rot in soggy ground. Dig holes or a trench 3 x deeper than the bulb’s height. Plant bulb root (or plate) side down and cover with soil. 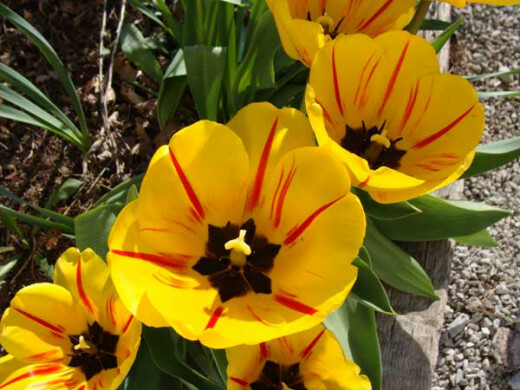 Add pretty color with old fashioned looking Triumph tulips. They are a bit shorter than Darwins, but their large flowers are held on sturdy stems. These bulbs are grown to flower this spring, and don’t forget that they can look lovely in containers plantings, too. Nothing says spring like a bunch of colorful tulips. 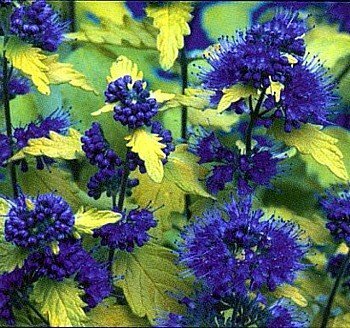 Plant them towards the front of the flower bed.They bloom mid-Spring. Daffodils and grape hyacinths usually bloom together. They are just one example of the layering technique, where large sized bulbs are planted deeper with small ones are planted a few inches higher. 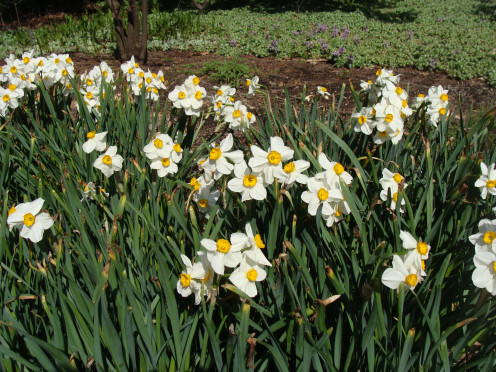 This produces a carpet of contrasting color for the larger blooms of Daffoils and Tulips. It is a favorite method of Dutch growers in their display gardens. Check bloom times on bulbs for the greatest likelihood of pretty garden pictures. Given the variability built into Mother Nature it still is no guarantee that the bulbs will all flower on cue. However, the upside of that truth is that sometimes many flower simultaneously with other plants that you didn’t expect. This past winter delayed everything in my own garden, and provided quite a few surprises, but in normal years the inner clocks of the flowers are dependable. Low growing perennials like Moss phlox ( Phlox subulata), Iberis sempervirens, ‘Basket of Gold’ Alyssum at the feet of tulips are probably the best of the blossoming spring show. The moss phlox and Iberis are also attractive groundcovers all season long with attractive foliage that persists and smothers many weeds. In my driveway garden, this carpet of moss phlox is paired with red tulips and golden daffodils. What Flowers Make You Think Spring? Are you making fairy furniture? 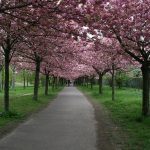 While there are many perennials which flower in springtime, it is the Dutch flower bulbs like Tulips, Daffodils, and Crocus which most of us identify with the beginning of the new garden season. In fact if you would choose an icon for the Spring, it might well be one of those blooms. Although they may not come first to mind, there are a plethora of other flowers that bloom from bulbs in the spring: Hyacinths, Frittilarias, Snowdrops, Glory of the Snow, Eranthis, and numbers of lesser known like the Alliums and dainty bulb forming Irises. Start the garden out right with a plan that includes a display of these easy care bulbs with good looking perennial plants to bloom with them, or cover them later. I like to grow perennials with Spring flowering bulbs, not just to cover the dying foliage, but also as companions that bloom in tandem with them. 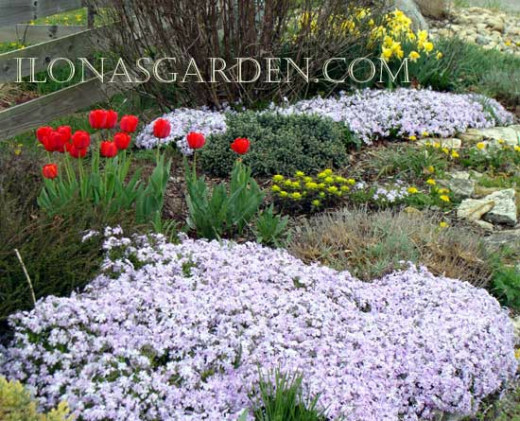 Low growing perennials are the classic pairing, Phlox subulata, Arabis, Basket of Gold are just a few. Forget-me-nots and pansies create bright, colorful panoramas of bloom along with the larger flowers of tulips and daffodils. 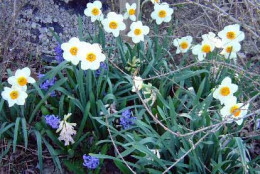 Perennials that are slow to emerge will give the bulbs time to bloom and then cover the fading foliage. Hostas are ideal, but daylilies are better for sunny spots and keep the color going into summer months. What Sort Of Fertilizer Should I Use? Fertilizers such as bone meal or the special formulation sold for bulbs create perennial vigor and bloom. 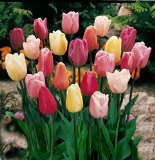 Organic fertilizers are often slow acting and soil building which is just what bulbs like to produce gorgeous flowers. Be sure your flowers come back year after year and bloom to maximum results by adding fertilizer when planting and annually thereafter. I personally prefer to add bone meal, which has a typical analysis of 3-15-0. The middle number is phosphorus which aids in root growth and promotes blooms. Fertilize as you see the shoots emerge, and then after bloom each year. Remember that roots are growing under ground in the fall, and that is another period of time to add slow release fertilizers. The food that is formulated especially for bulbs takes out the guesswork. “Scatter” is the operative word in naturalizing. Whether you scatter the bulbs on top of the ground before planting, or scatter seed after the flowers set seed, the effect is as if mother nature herself were at work. 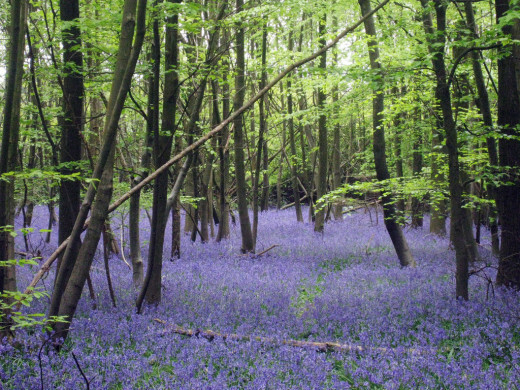 Have you ever seen pictures of a river of blue flowers among trees? A lawn with an endless parade of spring flowers such as daffodils, or even a hillside covered in crocus? They probably did not get there by accident, but by the artful planting in a style called “naturalizing”. Some bulbs will helpfully seed and multiply, but many need a gardener who distributes bulbs each year in a way that looks so unstudied that it seems as though it had to be Mother Nature. It is easy to do. Simply choose the bulbs you wish to grow, a spot where they can be left alone after blooming (remember they need time for leaves to die down), and patience. 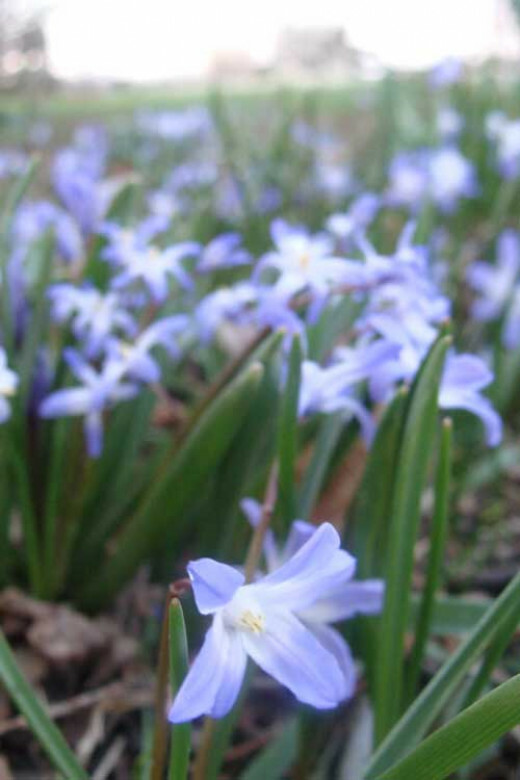 Scillas and Chionodoxa are easiest to grow this way. Crocus is a little more difficult, because rodents may eat them and they don’t spread through seed in most gardens. I like to scatter the bulbs in the area I want to plant them, and then use a shovel or trowel to open the ground. Drop in the bulb with a bit of bone meal. Done! Under shrubs and trees when a neat lawn is required; in the lawn itself, if you don’t mind some weeks of shagginess for withering foliage. Along a driveway, mulched during bulb dormancy, is a pretty way to naturalize Grape hyacinths. In lightly wooded areas, on hillsides, within a shrubbery. 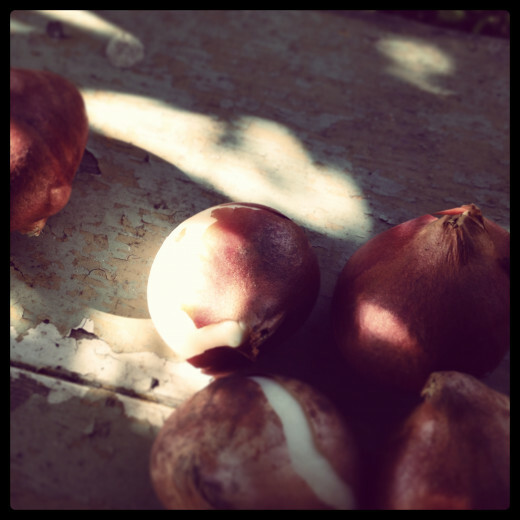 PLANTING BULBS IN FALL TO BLOOM IN SPRING. Daffodils readily multiply. In fact, they will need to be divided every once in awhile if they become crowded; but this simply results in more free bulbs for you! After bulbs bloom, snip off dead flowers, leaving stems. Allow all green parts to wither and die down, or lift bulbs and keep in a cool, dry place. Allow to grow in situ until bulbs no longer bloom well. Then lift, divide, and move. Don’t allow to go to seed unless they are minor bulbs which you wish to naturalize. Seed formation weakens daffodil and tulip flowering. Allow all strength of plant to go to bulbs. Lightly fertilize in following fall to help roots and plant prepare for next year. Take off the spent flowers to prevent bulb strength going into seed production. Garden Snips I consider my garden snips to be invaluable for the job of dead heading and a surprising number of other garden tasks. Read my review of the economical, favorite brand I use. Is The Ticket Too Big? On “big ticket” items like swimming pools or hot tubs, is the price really too big? If it interferes with your ability to pay the mortgage, yes, but what if it is something that you could afford if you saved for it, or if you could see its benefits? Both swimming pools and hot tubs … and other such features can come under this heading. For me, a hot tub has repaid itself many times in the benefits it has given when it comes to helping mobility and recovery after stiff joints and muscles were a problem. Be sure to factor in more than simply the price of an item when deciding whether it is a priority for you. In Victorian style to complement the Queen Anne house this yard is packed with ornament and furnishings. Not everyone can afford to fully landscape their yard all at once, just as they don’t furnish a home’s interior instantly, either. Set up a plan that includes the important features of your yard and outdoor landscape, create a budget and a plan to put in those important to you and your family. If you have children, include their needs: a swingset, playhouse, or sandbox? 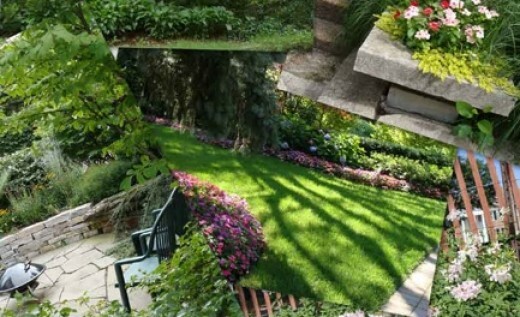 Make your yard a place for fun and relaxation as well as tasks. Use budget plans just as you would for other expenditures- don’t leave your yard last on the list. Included in your plan are various pieces of garden furnishings, depending on which portions of the landscaping on next on the list. 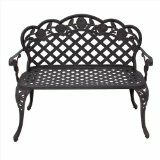 Graceful garden seating made of cast aluminum gives a timeless inviting look to your yard. More than a hundred customer’s reviewed it with high marks and satisfaction. 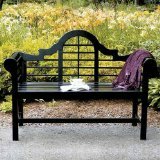 A bench like this looks wonderful with Victorian style homes, many traditional styles of farmhouses to townhouses. I love the simple, rustic look of the old Adirondack style. Of all the advice I’ve tested and given, the importance of having seating in the garden is the best tip in all my garden furniture opinions. 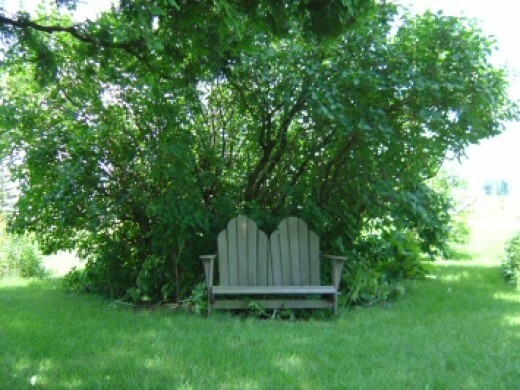 I’d say a well made bench is mandatory for enjoying the true pleasure of a garden. Whether it is to enjoy the views, or take a well earned rest from accomplishing the chores, a chair or bench is most welcome. Surprising in the many styles and materials available, I think that benches, especially in the “Adirondack” or classic “Park Bench” styles give the greatest satisfaction. They are roomy, sturdy, and have good looks, so that the seat actually performs as a great focal point of design as well. The Adirondack style is American traditional seating which makes me think of vacations in the mountains or relaxing beside the beach. it is just as famously relaxing and comfortable in a backyard, among the perennial borders. So popular they come in a number of colors in both wood and resin materials. A bench at the end of a pathway, or situated under a the arching branches of an ornamental tree or tall fragrant shrub, these are delightful perches to watch the birds and butterflies while taking a breather or enjoying a morning cup of coffee. The Lutyens Bench was a design that adorned gardens designed by the great partnership of Gertrude Jekyll and Edwin Lutyens. This graceful piece of garden furniture features scrolling lines that meld most harmoniously with the curves and clouds of an English style garden. It is modern enough for contemporary architecture, but traditional enough for any classically designed home. The point is, if one cannot sit and enjoy the garden it seems much of the reason of having one is lost. Striking a balance between work and repose is part of a healthy lifestyle. There is a lot more to that old adage of “Taking time to smell the roses” than simply a tired repeating of something one has heard in conversation. A garden bench is a necessity for inviting one to smell the roses, listen to the birdsong, and recreate ones heart and mind. Where Are The Table and Chairs? What did I leave out of my personal list? 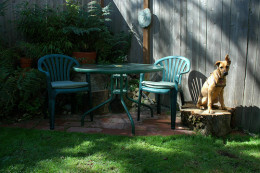 An outdoor eating area, like a patio table and chairs, with a table umbrella, is one popular set of garden furnishings. Although we have them, our family hasn’t used them in recent years. Recently, we greatly increased eating alfresco during the outdoor season. A “Char-Griller” charcoal burning grill. One of the things that makes out large deck space comfortable is the addition of large citronella candles and a couple oil burning torches. These repel mosquitoes. My son has those electric “zappers”, and they do a very good job. Using your outdoor furnishings combine both choosing them and setting up the space for maximum enjoyment. Using tables and chairs makes an instant invitation to social gatherings around al fresco repasts. I have had a plan for a small cafe table and two chairs to tuck away in a sheltered corner of the yard. It would be a private place for morning coffee, reading, dreaming or just a nice place to chat with a visiting friend. 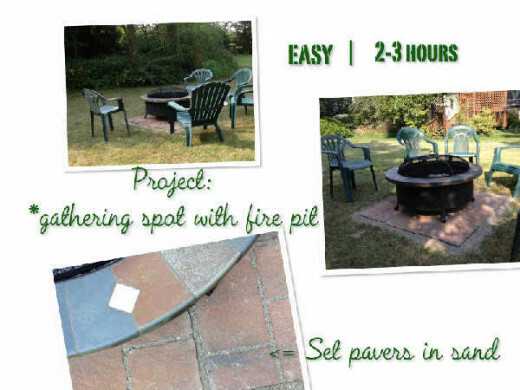 Years ago, I remember seeing the addition of a firepit space in garden plans and just didn’t see the attraction of it. After all we would grill food on our Hibachi, occasionally burn leaves and have a small bonfire out in the fields, why would we need a fire pit? Little did I realize how wrong I was. Not until visiting my son and enjoying the evening conversation around his firepit with some comfortable outdoor chairs, did I understand how cozy it was and how much fun the combo of a fire, friends and the outdoors could really be. So what did my husband and I do as soon as we returned home? Yes, we bought a fire pit, and set it up immediately- I mean right away before even building the paved space for it. We absolutely loved it, and have had many enjoyable family conversations around our new fire pit. We did find that there is enough heat underneath to merit a fireproof paving pad to set the fire bowl on (we decided on inexpensive patio pavers). It was just a matter of an afternoon to completely construct a great gathering spot for our family and friends. Now, I would put such a garden furnishing top on the list. 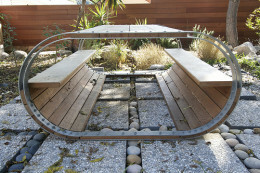 We use garden chairs, but I’ve also seen these areas constructed with surrounding benches. Seating is an important part of the firepit area, but it doesn’t have to be expensive at all…unless you want it to be! This is one of those projects that can cost anywhere from Zero dollars to Thousands. It just depends on what level of expenditure you can make, or are willing to make. 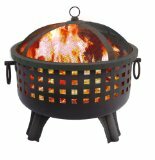 We chose a fairly inexpensive portable manufactured firepit . There are gas-fired models that require major construction costs to install…. and many different choices in between. 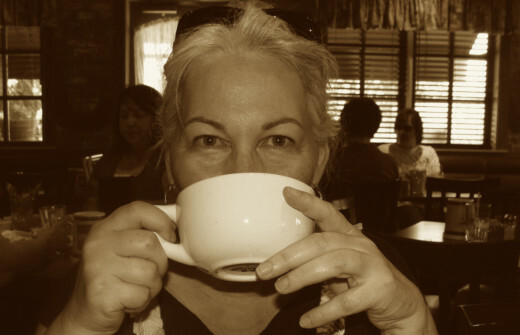 The only thing that I advise is that you have one -if you think you will enjoy conversations sitting around a nice warm, crackling fire, enjoying a warm mug of your favorite drink in the evening air of the outdoors. It is something I love. For some, their grill is a mainstay, with an entire kitchen and dining in a patio area. If this is you, those table and chairs might be top of the list for making the yard meet the ideal you have in mind. A picnic table, with its incorporated benches serves as an all purpose eating, gathering, or resting station. For me, it also doubled as a handy workbench. Consider what works best for you and your dream of a yard. 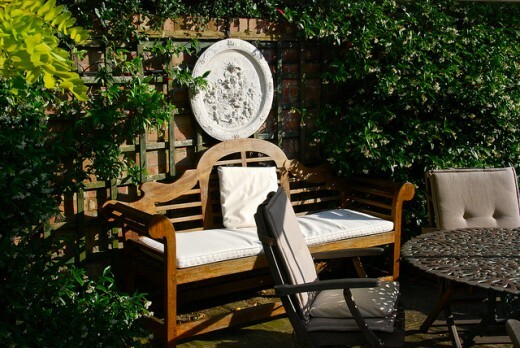 Make your list and create a welcoming and useful outside space in your garden. These are just a few of the possible furnishings for a garden, but the ones I think are most valuable. Last but not least in my list of essentials for garden pleasure, or just feeling good during almost any time of the year is the Hot Tub. At the time we purchased it, it seemed an almost unconscionable expense for our middle class budget, but we had friends that had sung the praises of theirs and that convinced us. We went shopping for a hot tub. While we do use it for family times together on occasion, it hasn’t worked out as much for that use as for a great way to soak away aches and pains of overworked joints and muscles. It is very therapeutic for that! And a great way to enjoy the outdoors during a snowfall, too. 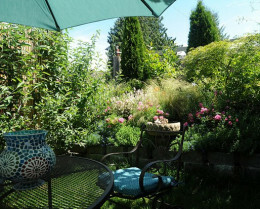 I put this garden addition quite high on a list of priorities, if a person has the space for it in the yard, the budget, and think they would enjoy quietly soaking in a lot of hot water! Buy from a reputable dealer who will offer service. Research and get the best brand that you can afford. Keep everything clean- use a few rules about use of the hot tub: keep suits free from laundry detergent ( suds! ); shower before using; limit alcohol use. Change water and filter as recommended; use the necessary chemicals according to directions. Like many garden projects, adding furnishings to your home landscape can range from practically zero to “the sky is the limit” in cost. Have a tight budget? Consider a few handy ideas for cutting costs. Do it yourself. If you have skills, this is a major cost cutter. Buying plans and raw materials to build a playhouse, a picnic table, or a firepit (as a few examples) can make your plans affordable. Repurpose and buy used. Whether making a new project from something old or buying what you want from a garage sale- the trash to treasure path makes garden furnishing not just economical, but environmentally wise, too. Have really big plans, and want some outdoor luxury? Create a plan and installation schedule; research your choices.